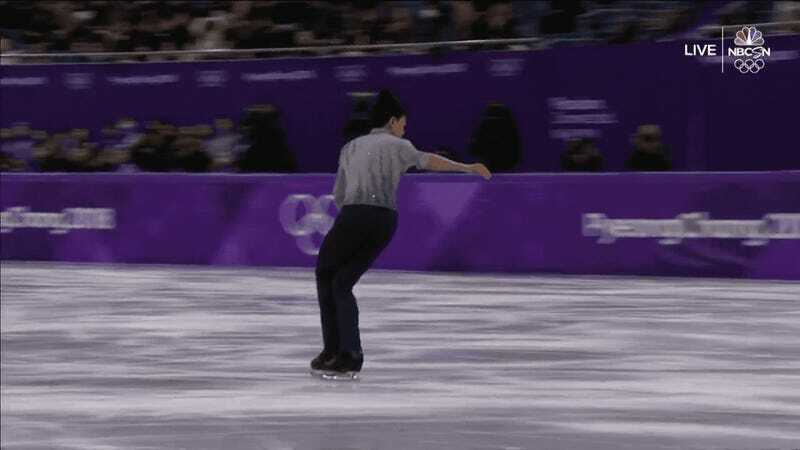 Seventeen-year-old Vincent Zhou, the youngest American competing in any event at these Winter Olympics, pulled off a move tonight that no one at the Games had ever landed cleanly before: the quad lutz. It’s the most difficult move currently recognized as achievable, and it requires four rotations after a jump from the outside of one foot, with the skater landing on the outside of their other foot. Zhou is not simply happy to be here at his first Olympics. His short program was the most technically demanding of any of the male skaters and, while he wasn’t perfect, his 84.53 score will likely put him in the top tier of skaters heading into tomorrow’s free skate. Here’s a full performance of Zhou’s short program, set to Snow Patrol’s “Chasing Cars,” in a much more low-key setting, from last year.